Felt that with the range of confusion and misinformation about this topic one of these would be handy. Let me know if I get anything wrong and what I'm missing and I will add and change this to reflect it. A: You will need an Appradio 2 running version 8.30 of their software, an iPhone 5, a lightning AV adaptor, an hdmi cable, and a lightning cable. Q: why can't I just use a lightning to 30 pin connector to use my appradio 2? A: the lightning to 30 pin connector does not provide a video output necessary for appradio apps to work. It only provides USB data, power, and analog audio out. Q: Do I need the pioneer cable to use my iPhone 5? A: No. 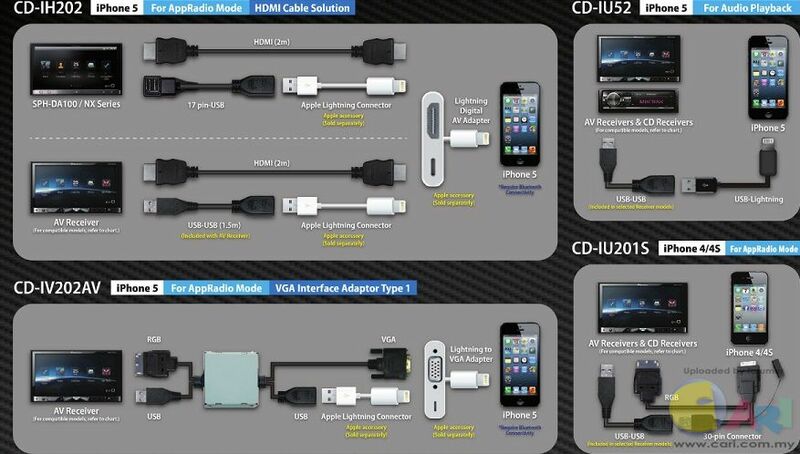 The pioneer cable is just a simplified version of the cable that already comes with the appradio 2 and an hdmi cable. Plugging your lightning cable into the USB port of the iPhone cable that comes with your radio and using your own hdmi cable will produce the exact same results. Q: Why doesn't pioneer update my appradio 1 to work with my iPhone 5? A: Because they can't. The appradio 1 has a simpler Bluetooth system that is not designed to control the phone in the way the appradio system needs. With the appradio 2 pioneer already set the system up to control phones via Bluetooth for android devices while using hdmi for video and audio. The iPhone uses a modified version of this system. Q: why does it need Bluetooth to control my phone? A: because the lightning AV adaptor does not provide the appradio 2 with a usb data connection. The lightning port on the AV adaptor is solely for power. Q: How long does it take to connect via Bluetooth? Q: Why is pandora so slow now? A: unlike all other appradio apps, pandora is run from the radio's hardware and not mirrored by the phone. The built in app normally gets the data you see via the USB data connection. On the 5 that is not possible. It instead gets the data it needs from Bluetooth. Bluetooth is far slower of a a data transfer system than USB 2.0 so it slows the system down downloading the necessary data to run. Q: why don't some of my apps work anymore? A: apps need to be updated to support iOS 6.1 and the iPhone 5 to work with appradio. Until your app is updated it will not work. Check the pioneer website for a list of supported iphone 5 applications. Q: Why is the iPod app broken? Lightning AV adaptor does not provide. Use carmediaplayer to control you iPod music on the appradio. Unlike pandora the iPod app does not support control and metadata via Bluetooth. Q: can I mirror my display? A: Yes. You need a parking break bypass. Q: Can I control my non appradio apps with appradio? A: not yet. Check the betas for appradio extensions. It may be possible in the future. Topic has been "pined" Thanks for the write up. For those that have this error from Maps says "Failed to received GPS signal", remember to enable location service for AppRadio app in your iPhone 5 (Settings > Privacy). Has anyone tried these yet?... I'll try the simple one tomorrow, the other I may have to see if someone could make me a female to female cable like that. Since the lightning cable will not carry video/sound through the 30-pin adapter. Do you think using a Lightning Digital AV adapter ( iphone5 end ) - HDMI/Data-cable in the middle - TO 30-pin digital AV adapter (headunit end) would work? Only thing I can find is a female on both sides 30-pin adapter to have the male end of the pioneer 30-pin connect with the 30-pin AV adapter. I am determined to find that adapter, or a second choice... simply see if using a lightning to 30-pin adapter can plug into the lightning to the Digital AV and hopefully have controls going over the wire versus the bluetooth. But the AR2 is set in that A/V mode to take controls over the bluetooth.. well we will see. Why go through all of this if there is already a working solution? Will the iPod app button on the appradio work for the iphone 5 if I purchase the pioneer usb to lightning cable? I just like the convenience of accessing my music without having to launch the "apps" then "car media player." Anyone ever tried this adapter? Wonder if it'll do the trick? It might work for audio but that's it. And that's if it works at all being that it is a no brand item made in China. Regardless there is no point with an App Radio if it won't support app mode. It's already been verified that 30pin to lightning adapters don't work. Before I get totally frustrated, I need some help/advice. My AppRadio has pretty much been working fine with my iPhone4 but two weeks ago I made the switch to iPhone6 and now I need the (correct) cable to interface the AppRadio SPH-DA210 to the iPhone6. Obviously I have the iPhone4 cable which I don't know if it comes apart only from the back of the radio or in the middle. Is there a part number for the iPhone6 cable and as an aside, is there any advantage/disadvantage to using an old iPhone4 that is deactivated and jailbreak it? I mainly use GPS Drive and the phone in the car but I've heard that IOS 8 won't allow you to enter an address. Puzzled. OK, well thats a start. I'm a believer in trying to use the tested support parts with real parts numbers. What is the part number and where can I find the cable online? I looked on Amazon and there were warnings that not all cables have the ability to carry video through a iPhone6 cable, all they'll do is charge the phone.